Rotate facilitators. Trade off note-taking. Let a voice at the margin take centre stage. Sharing responsibility increases participation and investment, taps the gifts of all group members, and leads to better results. 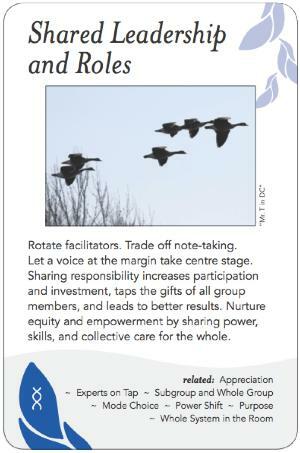 Nurture equity and empowerment by sharing power, skills, and collective care for the whole. Recognize different ways that people develop a sense of ownership or investment in a process, project, task, or function. For example, can be through time, energy, or care investment. Core actors are able to invite and allow others to step in while transitioning to an advisory or mentoring elder role. Space created for acknowledging difficulty of releasing attachment to role, without being judged. Trading off roles often occurs in one of two contexts: either organic need (a recognition that the current role-holders are not serving the organization) or from the desire of a member in jump into a new role. When a role is being created and filled for the first time is a perfect time to frame the role as a "good fit in the current context" as opposed to an achievement. Differentiation between shared roles and surrendering a role as a form of conflict avoidance (ceding "power" to whoever wants to step into a role). It's important to balance a graceful ability to trade off roles and a need for a common understanding of what the role entails. At WS, sociocratic election to reform green team required both a willingness to step out of the team by those not called by the community, and a willingness to step in by those not eager but called. At Quayside, a new member with a strong organizational background decided with the best intentions to lead the maintenance team, which up to that time had been working in quite an organic "free form" way. When a specific project needed attention, his leadership style came into conflict with the previous way... both he and the existing committee had to adjust to a new way of working. (Check on using this) At OUR Ecovillage, when examining the best fit for roles on the Co-op board, the decision was made to see who might be the initial team as a whole, rather than examining each role independantly. Letting the specific roles come afterwards set up a framework in which future shifts in aspects of these roles would be easier. Levels / Fractal: This can happen from the moment-to-moment shift of facilitation in a meeting, or occur up to the level of major role transition within an organization. - Balance between the culture of an organization and the need to get tasks done – the approach taken in stepping into a role can lead to a graceful acceptance, or resistance. Note: “Founder Syndrome” is an antipattern to Rolling with Roles. Note: What's most useful for Facilitators (Process Architects) to consider when designing a process to make rolling with the roles optimal? Note: Recognize that we take on and put down roles – they are temporary, and needn't become an entrenched part of our personal identity or our persona/worth within the organization. Note: When roles are shifted more frequently, it helps shift an organization's perspective on roles, and easy of transition. Note: Inherent in any role should be the notion of how regularly it's shifted. A sense of temporariness is important. A recognition of roles as fluid and temporary. Note: There is a paradigm shift from viewing a role as an achievement to viewing it as a good fit in the current context. Note: When a role is seen as an achievement with a certain prestige attached, it can provide both an impetus to do the role well, but also a pressure that can move the role-holder towards burnout in their attempt to affirm their “right” to the role. Note: An organizational context in which everyone has roles and they transition relatively frequently is an antidote to an “us and them” mentality in regards to organizational power. Rather than an artificial reverence for the role-holders, roles are seen as important but interchangeable and temporary depending on fit. Note: It's worthwhile examining not just how to make a given role change graceful, but how to create a culture that fosters this sort of ease. Notes: It would be interesting to explore the use of Theatre and the fluidity of roles in activities such as theatre sport in order to foster a sense of the fluidity in change of organizational roles.